Do you ever get intense cravings for foods you don’t normally like, or is this just me? I got through periods where all I can think about is eating a rich eggy potato salad, or a traditional creamy cole slaw. These are dishes that I normally pass over in a buffet because I prefer my potato salads dressed with lots of mustard and vinegar, or with a pesto sauce, and my cole slaws bright and tangy with vinegar and citrus. Similarly I will take a no-thank you helping of pasta salad when presented with it in a situation where I have to take some to be polite, and skip it entirely if etiquette permits. I don’t like mayonnaise, and I’m not particularly fond of cold pasta, and I find that even the smallest serving sits leadenly in my stomach. I have, nonetheless, been day dreaming about pasta salad for the past three weeks straight. I don’t want a bowl of spaghetti dressed with rich tomato sauce, or a plate of fettuccini tossed with decadent alfredo sauce. I don’t want buttered and salted noodles to soak up the sauce from a braised stew. I want cold pasta. Go figure. 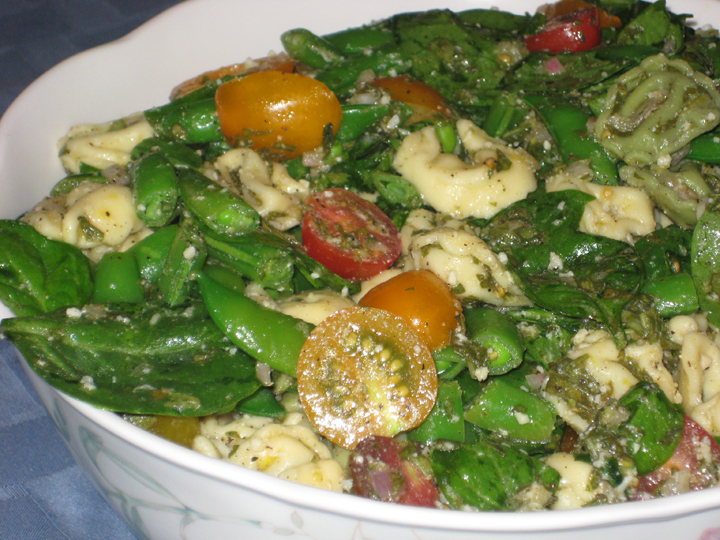 This is a pasta salad that’s rich from the cheese filling in the tortellini, lightly dressed with a zingy lemony basil vinaigrette, and enlivened with fresh cherry tomatoes and sugar snap peas. 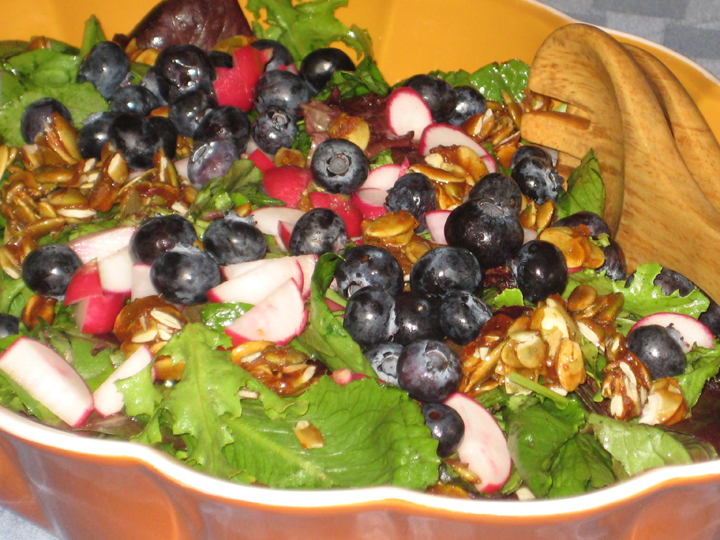 This is not the sad gloopy pasta salad lurking on the corner of the buffet table. This is a pasta salad I may start craving more than just once in a while. Whisk together the olive oil, chicken stock, lemon juice & zest, basil, shallot, garlic, salt and pepper. Cook the tortellini according to instructions. Drain, and then while still hot toss it with the dressing. Stir in the spinach (the heat from the pasta will wilt it slightly). Refrigerate for 30 minutes. Before serving toss with the cherry tomatoes, sugar snap peas, and parmesan. Adjust seasoning to taste. This can be made the night before and refrigerated. Refresh the flavors by tossing it with a drizzle of olive oil and lemon juice right before serving. * The packages of pasta that you get at the grocery come in 9oz units – use two of them – if you’re buying fresh go with 1 lb. ** To blanch the sugar snap peas drop them into a pot of boiling salted water for 30 seconds. Drain, and place in an ice bath. Pat dry. This can be done either as you make the salad, or a day in advance – just wrap them up in paper towels and keep in the fridge over night. *** I’d use whatever’s in season at the moment for this component – asparagus in the Spring, sugar snap peas in the Summer, broccoli in the Fall, etc. 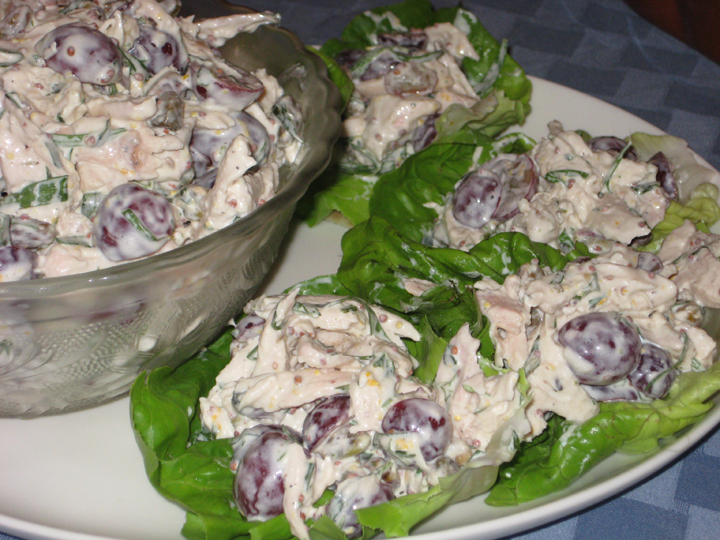 When I first posted a recipe for chicken salad way back in 2007 it was for a curried chicken salad. I noted that my mother swears blind that this was the chicken salad she made my entire childhood, but that this was a filthy filthy lie. This, for the record, is the chicken salad I grew up eating . . . . well, kind of, I’m reversing the mayo to yogurt ratio, adding orange zest, substituting pistachios for the pecans, and roasting instead of poaching my chicken, but other than that it’s exactly the same. Which is to say, it has tarragon in the dressing. Tarragon is not an herb that everyone is familiar with, or likes. It has a very distinctive herbal/anise-y quality to it. I like it, and I think it’s interesting and different, but it’s a flavor people tend to react either very positively or very negatively to. Just FYI. Season the chicken with salt/pepper and a tiny drizzle of olive oil. Roast it in a 375 oven until cooked through (about 40 minutes). Allow to cool. Remove the skin and discard. Remove the chicken from the bone, and then cut into bite size pieces or tear into long shreds (I think this looks pretty and rustic, but if you’re going for a more lady-like chicken salad for a tea sandwich use a knife to chop it into neat small regular pieces). Chop about half the tarragon finely (about 3 Tbsp chopped). Whisk together the mayonnaise, yogurt, tarragon, mustard, and vinegar. Season to taste with salt & pepper. Very roughly chop the rest of the tarragon – you want to be able to see the long strands of leaves. Toss the chicken, grapes, and nuts (of whatever persuasion), and roughly chopped tarragon with enough of the dressing to make it cohesive, but not gloopy. You may not need all of the dressing. You’re looking for roughly a 2 (chicken) : 1 (grapes) : ½ (nuts) ratio. Serve. I got all fancy and scooped some of it out into little butter lettuce cups, but that’s really very unnecessary.